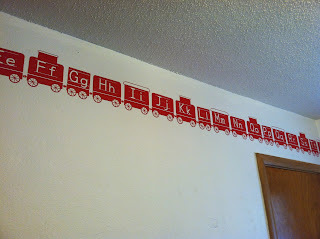 Our son is obsessed with trains, and we were thrilled to find a train decal at Dezign with a Z. We love that they offer decals that are gender neutral. 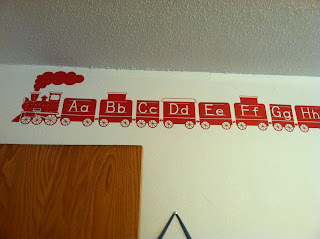 We also love that the train features the alphabet as the bedroom is shared with my 2 year old daughter and 5 year old boy, so it was perfect for their room! When you order your decal, you are able to choose from several colors, so it is certain to match the room's decor that you are using it in! We chose red, and the decal is actually a set of many decals. It is a really long and large decal, and takes up a significant amount of space. What I loved is that the train cars could be easily divided. We cut each section to make application far easier. We did go longer than one wall, and we simply started a new train on the next wall, so that they joined at the corner. I also liked that the included some smaller butterflies. This allowed us to test the decal on our wall to understand what we needed to do before we applied the much larger decal. For the train, we definitely felt it was a two person job. We needed one person on the ground with each decal, handing each to the person standing on the step stool. Also note that we hung them close to the ceiling, so that definitely influenced the number of people needed. We were really happy with the quality of the decals, and our children love the dezign! My son feels the room is a little more "his". MamaBreak received a decal in order review it here on MamaBreak. We did not receive any other type of compensation for the review. As always our experiences and opinions are our own. I love it! I love being able to decorate with quick and easy solutions like this. I love that train! So cute! I have really fallen for these decals! So cute and easy!! Great review! Now how cute is that train! What an adorable idea! 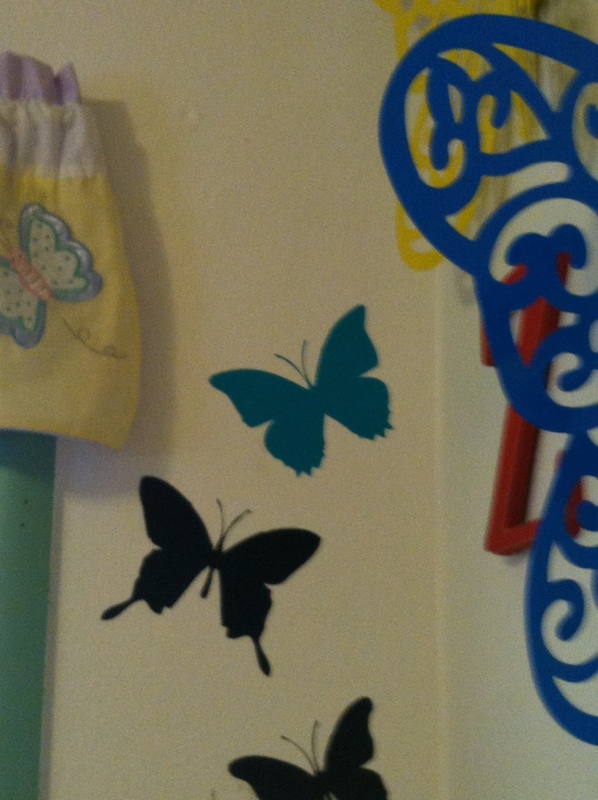 My little girl would love the butterflies.... cute! That train is adorable! I love the butterflies too. It is such a long decal. I have never seen something quite so large, but it was well worth the work! That train is too cute! I want some of these decals for the kids playroom. 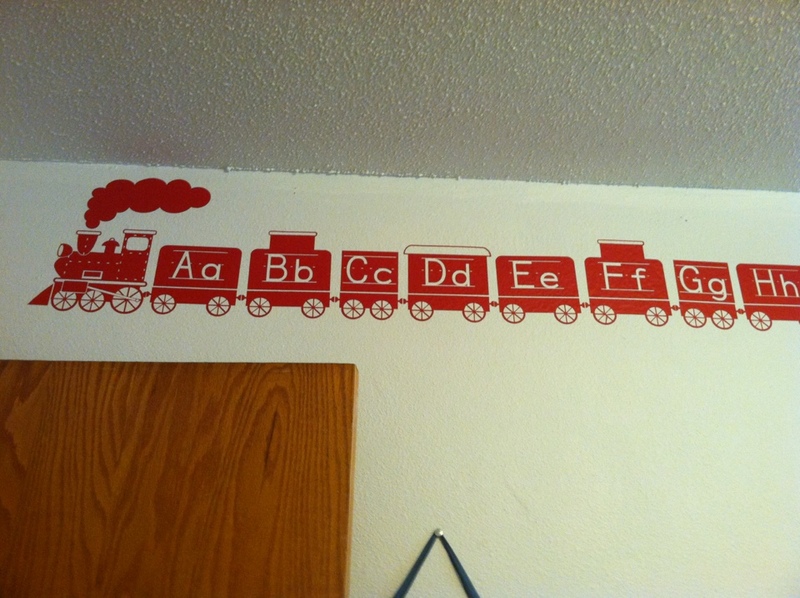 my kids will definitely love this, especially those choochoo trains up there. but the problem is we live in an apartment and i don't think we're allowed to put some like that in our wall, it'll probably damage the wall? 9/24: MMMMM . . . Monday! Top 5 Places . . . Minneapolis! Bag Blaze! Check it out! Top 5 in St. Louis! Wonderland Cake Giveaway! ENTER TODAY! Top 5 Places . . . Paris! Mrs. Meyers Review: It smells so Clean!